Compressed air dryers are the heart of a compressed air contaminant removal system. Together with in-line filters, they can be selected and configured to deliver clean dry air to your process specification. 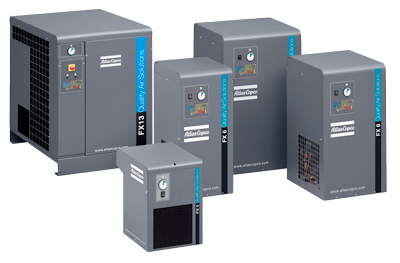 Refrigerant dryers, the most commonly used compressed air dryers – are used to prevent corrosion and eliminate free water from within compressed air systems, maintaining air quality at your desired level. Before an industrial compressor achieves 100 PSI air output, it will be producing significant amounts of water. To eliminate the water, think contaminant, the relative humidity in the system must drop below 50%. These dryers are most often made of the combination of an air-to-air and an air-to-Freon heat exchanger. In the air-to-air heat exchanger, the incoming air from the compressor is pre-cooled by the outgoing air (which is then heated). The compressed air passes through the air-to-Freon heat exchanger in the next phase, cooling down the compressed air even more to around 3°C. The moisture is condensed and free water is removed at this temperature, but 100% relative humidity remains. The compressed air is then heated with incoming air, causing the outgoing air’s relative humidity to fall below 50%. For all your refrigerated dryer needs, no matter the size of your compressed air system, if you are located in Kansas, Missouri, or Illinois, HTE Compressed Air Solutions can meet your needs for equipment, installation and life-long on-site service.